The white and gold WD My Passport Ultra USB 3.0 Portable Hard Drive provides 4TB of digital storage capacity for USB-enabled systems. The My Passport Ultra features metal and matte finishes and comes armed with USB 3.0 technology that provides up to 5 Gb/s transfer speeds. Powering the drive is accomplished via a bus-powered USB port. Furthermore, the drive comes preformatted for use with Windows, and a simple reformat is required for the Mac operating system. In addition to the My Passport Ultra, WD includes WD Discovery software, so you can import photos, videos, and files from social media and cloud storage websites to the drive. For safeguarding the data stored on the drive, password protection and 256-bit hardware encryption technology are on board. Aside from security, WD Backup software is provided to preserve content stored on your computer's drive. The My Passport Ultra drive fuses metallic and matte finishes to create a unique style. It fits comfortably in the palm of your hand, pocket, or purse, so you can easily take digital content anywhere you go. Included WD Discovery software connects to popular social media and cloud storage services. Import your photos, videos, and docs to the My Passport Ultra drive to help preserve your online life. The My Passport Ultra drive comes equipped with WD Backup software to help make sure your photos, videos, music, and docs don't get lost. Set it to your schedule. Pick the time and frequency to auto back up files from your system onto the drive. The My Passport Ultra drive comes with 256-bit AES Hardware Encryption with WD Security software built in to help keep your private content secure. Set your own personalized password to activate hardware encryption and data protection. Just plug in My Passport Ultra to start transferring and saving important content. Comes with easy-to-set WD Backup software to simplify your on-the-go lifestyle and WD Security software to help protect all your data. WD has formatted this drive for use with Windows 10, Windows 8.1, and Windows 7 operating systems. With Mac systems, reformatting of the drive is required. Box Dimensions (LxWxH) 6.4 x 4.6 x 1.5"
4TB My Passport Ultra USB 3.0 External Hard Drive (White/Gold) is rated 4.1 out of 5 by 12. Rated 5 out of 5 by Hipp from The Drive is great, the software is not! I love WD backup drives and have 5 of them but the new backup software is garbage. The Smartware that WD once used was spot on and easy to use but not so for the new WD Backup software. It is not intuitive and is difficult to understand. To top it off the software is extremely slow and makes me think that the software is not responding properly. When I call for support I am directed to India and have a difficult time understanding the individual. Although the tech is very nice I can tell that he is just as frustrated as I because I don't understand him. Sorry to say that the backup software makes me want to turn to another product line. Rated 3 out of 5 by Richard from Installation issues Upon connecting My Passport Ultra to my computer the software did not install as advertised. I had to install all 3 manually but only the backup software worked. I had to contact WD customer service to correct. They gave me a link to troubleshoot the problem but the troubleshooting results were not consistent with the instructions. Eventually I was able to troubleshoot and fix the problem myself. It appears that the drive is working OK but getting it to that point was a headache. Rated 1 out of 5 by Anthony from Horrible connection to computer The old passports worked so well, this drive (after painstakingly being reformatted to work with a MAC) disconnects so easily to the point where you have to restart your computer. You also can eject the drive without a "force eject" that compromises the data. I regret purchasing this and would purchase the old style of passports, unfortunately B&H doesnt carry them anymore. Buyer beware. Rated 4 out of 5 by AGB from Best price anywhere Best price for this WD product anywhere, but the quality of the WD has diminished. I have never had one go bad and yet 2 of the last 3 I have bought have had problems. WD problem, B&H Service & prices the absolute best! Rated 4 out of 5 by Joel from 4TB Passport Arrived packed well and performed as expected. Software acceptable. Was not disappointed in performance or quality. Only draw back was unit had less than 4 TB. (3.5 TB) The 1 TB passport I am is full, so I got this for additional back-up. Would not purchase any other brand. Would have given 5 stars if storage was 4 TB. Rated 5 out of 5 by TP from Good SSD drive at a good price It's reasonably fast, rugged, and? compact. And I should add stable. I bought a G-Tech drive R series drive for 3 times the price and it proved to be a bust. Granted, I wouldn't want to stream audio of off the Passport but I bought it for storage and backup, and it's perfect for that. Rated 5 out of 5 by Mint Photography from Great compact external hard drive with no power cords We love these hard drives , they are so sleek and take up very little room on your desk. The added attraction of no more bulky power cords makes this a no brainer for our photography studio . Rated 5 out of 5 by michael F. from Does what it should do Works fine as you would expect. It's a hard drive does nothing fancy, but it stores fine data. Is it noisy; does it feel hot to the touch? Does this WD hard drive come with a case? what RPM is the hard drive? What is the warranty on this WD drive? 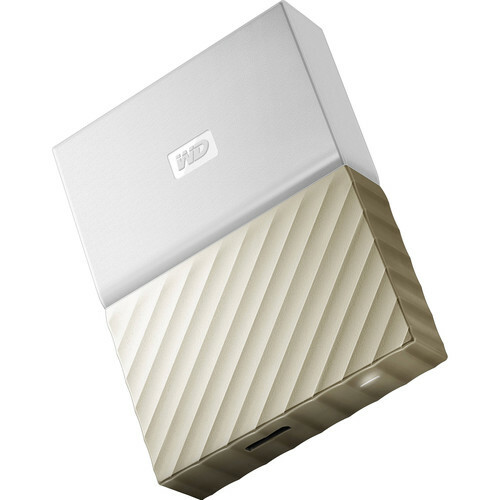 This WD 4TB My Passport USB 3.0 Secure Portable Hard Drive comes with a Limited 3-Year Warranty from Western Digital. How do I connect this USB 3.0 drive to a USB 2.0 computer? I have 2 of these drives and use each with a computer having USB 2.0 ports. The cable included with the drives works to allow me to use the drives with the computer having USB 2.0 ports. Works great. Can I use this drive with Acronis backup? I use Acronis and a WD Passport. Works fine. Does the included software (Backup and Encryption) work for Mac Users or are these Capabilities/Features lost when one formats the drive for Macs? According to the manual that comes with the drive, WD backup is Windows only, while WD Discovery, WD Drive Utilities and WD Security are both Windows and Mac (Mavericks through Sierra) compatible. WD Security implements password protection and 256-bit hardware data encryption. I have not verified this; I took it from the manual. The WD 4TB My Passport USB 3.0 Secure Portable Hard Drive includes a Limited 3-Year Warranty valid in the United States.